I watched this movie with a sense of awe I have not felt for any other musician. Not only does Nadja Salerno-Sonnenberg have a great sense of humor, she if overflowing with creativity and pure sassiness. Beneath her animated surface there also seems to be a hurricane of emotions which finds its release in her dynamic musical career. It is as if Nadja becomes the music she is playing or is it just that the music possesses her? She is intense in her original interpretation and hauntingly expressive style. 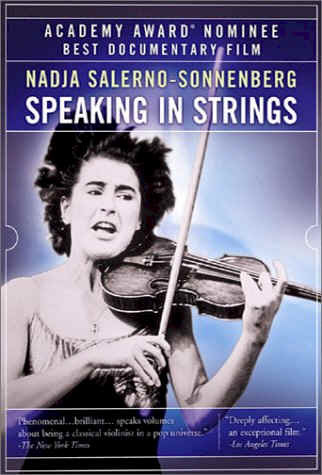 The music does not seem to be coming from the violin, but from deep within Nadja. You have to ask yourself why anyone so talented and filled with sensitivity would consider ending their life. Especially when you are one of the world’s preeminent violinists. What is so powerful about her story is how her mother tells her it takes courage to be happy. How true! It is far easier to give up in light of your circumstances. It takes a deep inner strength and sense of hope to continue in life when you would rather give up. Yet what a talent she has. While her talents were unquestionable at the time, her talent for living still needed to be developed. She had a passion for music, but no passion for life. Not only do we learn how Nadja’s father abandoned her family when she was a very young child, we also learn about her regret of never meeting her father. It seems from what she says in this documentary, work was first in her life and she put health and love second and third. She might be interested to know that smokers have a higher risk of developing depression. In the movie, she seemed to be a chain smoker. “Cries of the Heart ” by Ravi Zacharias might be helpful for anyone going through what Nadja seems to have experienced. “Manic Depression and Creativity ” by D. Jablow Hershman discusses Beethoven and other great talents through the ages. "The Omega-3 Connection " by Andrew L. Stoll would also be worth a read as nutrition is always important. Where does the love come from when you can’t supply it yourself? What makes life worth living when even your own amazing talent isn’t satisfying the longings of the soul? Nadja says she believes in God, but at times he seems really busy. There is definitely a difference between knowing there is a God and having a relationship with him. Or at least a reason for living that goes beyond this temporary existence. This musician’s life shows how material success and fame means little when maybe what we all really want is love and a happy healthy life. Not to mention hope in this life and hope for the life beyond. I truly hope Nadja has found peace and ways to deal with the sheer explosion of creativity surging from her very soul. An eccentric, wild and unorthodox story of a musician's passionate existence. Katja Bjorner's dedication to ballet is revealed in a personal profile directed by Donya Feurer. Her tenacity is ever present during the vigorous training sessions where nothing less than perfection is acceptable. Still, in this world of strict regimens, there is an undercurrent of elation as the dancers start to realize their dreams. The teachers express a warmth and patience that reveals they must truly believe in their student's ability to excel beyond expectation. One of the highly intriguing aspects of this sensitive portrait is how the ballet shoes are created. While dance itself is portrayed with exquisite beauty, the life behind the scenes is captured with equal clarity. The Dancer reveals the life of a ballet student from every angle, except having a personal life or friends outside of class seems completely absent. The dedication it takes to reach the desired level of perfection sweeps everything aside in favor of an art form that brings breathless beauty to the stage.